Being a mom-to-be doesn’t always begin the same way for everyone. Some women go through a normal happy pregnancy but for some getting pregnant is not part of the motherhood plan and you need to look at other options. If adoption is on your radar or you are currently going through the adoption process, good for you! Around 135,000 children are adopted in the USA each year according to PBS POV statistics and it’s a wonderful thing to do but one thing is certain, the process can be hard. Usually lengthy and in some cases exhausting, staying hopeful and positive during the adoption process is not an easy thing to do, but you can do it! 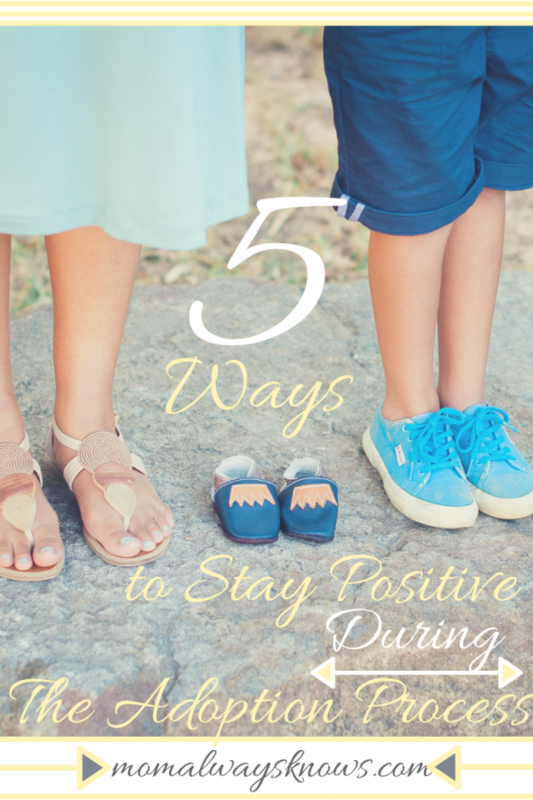 Here are 5 ways you can stay positive during the adoption process all the way until that sweet little bundle of joy is finally in your arms! Just know your emotions will be up and down during this process. Before beginning ensure you take the time to grieve not being able to get pregnant on your own, if that’s the case. This can help make the process of adoption better for all involved. Adopt the child for the child and not for yourself because the child will sadly not fill a void. Be sure that you and your partner are both on board 100% about adopting a child as there are many couples who have a one-sided commitment and this causes families and marriages to fall apart. Know that there are many steps to this and some are lengthy and some might not go your way. You have got to keep your emotions in check. You will have friends and family members who may not understand why you are adopting and this could lead them to saying things that are hurtful. Some may disagree with you and some may even cut off the relationship but you just have to remain hopeful. Just remember to stick to your personal beliefs and know that this is the best decision for you, as well as your partner and you don’t owe anyone an explanation. Be patient and do not lose hope when things don’t turn out as you envision. Talk to others who have been or are in the same situation as you to help yourself remain hopeful during this time. The worst thing you can do is try and be someone else to impress the birth family or person making the decisions on your adoption. Always be open and honest, supportive, loving and a good listener. It may be challenging when you still don’t know the result or what is going to transpire but as long as you are being true to yourself then there is no such thing as failure. Love the baby and the biological parents while you are waiting for the papers to be signed because that memory will last forever and you may be all they have in this world. Biological parents as well as adoption counselors can be very helpful so making sure you are always kind and loving can increase your chances of getting approved for adoption. Find other moms or families who have gone through the adoption process (or currently are) and pick their brain. You can also find mom and support groups online or in your area to get connected with those who have had similar experiences and that can be quite helpful. You don’t have to do this alone and the info they provide you will be invaluable if this is your first time and help you stay positive during your adoption process.